This escalation league will be played on an eight-week schedule, with rounds lasting two weeks. This time, we're going big! The league will run from 150 points to 240 points. Each player may choose to field a Rebel, Imperial, or Scum & Villainy squad. You may not have more than eight small ships of the same ship type (TIE fighter, A-Wing, etc.) in any squad. You may not have more than four large ships of the same ship type in any squad. During each round, each squad must contain all ships and upgrade cards from the previous squad. Ships from the previous round must keep all equipped upgrade cards, and these cards may not be “transferred” to a different ship. However, new upgrade cards may be added to ships from the previous squad. Matches will be played on 6' x 3' playing surfaces. Entry fee is $15 and sign-ups are open until the start of the league. 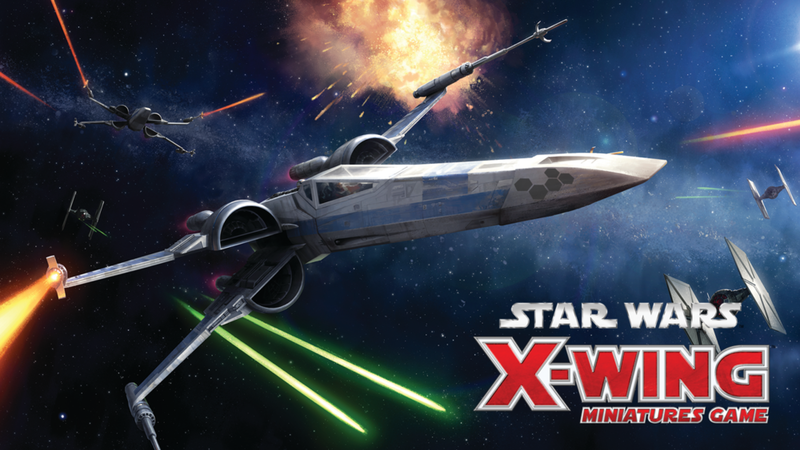 All league participants will receive 10% off X-Wing products for the duration of the league. Every round, matches will be played at the current point level. Pairings will be available the Monday following the close of a round on Challonge, and you will be paired against a similarly-ranked opponent. All results are due in by the Sunday of round end by midnight. Results must be reported to the employee on staff directly after the match has finished. There will be no make-up rounds in this league - all matches must be completed in their assigned time frame. If a match is unable to be completed in its two week period, either player may forfeit the match to the other. If neither player wishes to concede, the match will be recorded as a draw, with 1 tournament point awarded to each player. At the end of each match, the player who has destroyed more squad points adds the amount by which his score exceeds his opponents score to the available squad points for that round and records it on his score sheet. The player who has destroyed fewer squad points subtracts the same amount from the available squad points for that round and records it on his score sheet. For example: Luke destroys 15 more squad points than Anakin in the first round, earning him a win with a margin of victory of 75 (60 + 15). Anakin’s margin is 45 (60 –15). If a player destroys all of his opponent’s ships, his opponent’s squad is worth full squad points, even if it is worth fewer squad points to begin with. If both players destroy an identical number of squad points, each player receives a Margin of Victory equal to the available squad points for that round. If a player concedes the match, treat all of his remaining ships as destroyed. If players have identical win-loss records, the tie is broken based upon Margin of Victory. The player with the highest Margin of Victory wins the tie and advances. If the players are still tied, calculate the strength of each player’s schedule by combining total match points of all their opponents. The player whose opponents had the highest total combined match points wins the tie and advances.